In “Remain Free,” author Gautam Narula chronicles his unlikely friendship with death row inmate Troy Anthony Davis, who was convicted in 1991 of murdering a police officer three years earlier. When Narula was just fifteen, he learned of Davis’s case and the doubt surrounding his guilt. Moved by what he heard and read, Narula wrote a letter to Davis, which began a relationship that would span three years and included written correspondence, phone calls, and even death row visits between the two. As inmate and teen get to know each other, Narula becomes passionate about saving Davis’s life and Davis becomes a source of advice and encouragement as Narula navigates life as a teenager. In “Remain Free,” Narula has compiled and shares letters, transcripts of phone calls, conversations, and memories of visits the two shared while also providing a record of his own actions to free Troy Davis from what he feels is a wrongful death sentence. 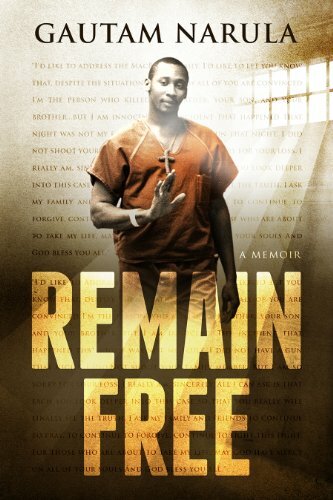 “Remain Free” is not just a recounting of the politics, harsh realities, and humanity of Troy Davis, it is the personal story of a young man’s disillusionment with the legal system and society in general, and how he is driven to change the world. Who knows if Troy Davis was really an innocent man? There are always two sides, but Narula includes some compelling details for readers to think about, casting doubt on Davis’s guilt and whether or not he got a fair trial. Gautam Narula is clearly an exceptionally good writer; however, the book needs editing to clear up issues including typos, pronoun and punctuation errors, and repetitive content which made it seem like he wasn’t giving the readers credit for remembering what he has already told them. Additionally, the story doesn’t always move chronologically, which is sometimes confusing, and some of the stories go into so much detail that they are distracting and tedious. Overall, the book is intriguing. The Troy Davis portrayed by Gautam Narula was thoughtful, intelligent, and deeply spiritual. When asked why God allows bad things to happen, Davis told Narula, “God gave us free will, and if He always cleaned up our messes, we would never grow. He allows us to live with the consequences of our mistakes so we can learn from them.” Whether Davis was authentic or not, there is no denying that Troy Davis made a positive impact on the life of one teenager, which resulted in one teenager wanting to make a positive impact on the world -- including designating all publisher and author profits from “Remain Free” going to The Innocence Project.